Michael Baraka Nyakabeji, born on June 27, 1990, Congolese from D.R. 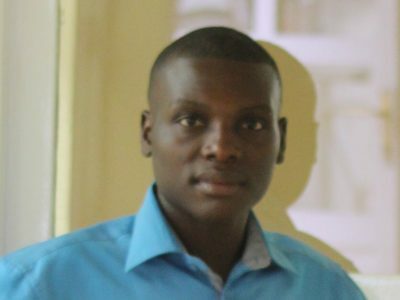 Congo, has defended his dissertation and obtained his degree in Biology in 2015 at the ISP (Institut Supérieur Pédagogique) of Bukavu. In his dissertation, he was the first to conduct research on the macroinvertebrate diversity and the physico-chemistry of the eastern flank rivers within the Rubenga Chiefdom, Idjwi Territory in the Democratic Republic of Congo. As such, 3 scientific articles are being drafted and shall be published in near future. During 3 months (from February 8 to May 8, 2016), he completed a training course in primatology at the CRSN (Centre de Recherche en Sciences Naturelles) in Lwiro. – Training on mapping using QGIS software; etc. In May 2016, he began his scientific research on the Schouteden’s blue monkeys (Cercopithecus mitis schoutedeni) ecology and behavior living on Idjwi Island, in eastern Democratic Republic of Congo. Indeed, he intervened in the training and led the Idjwi’s monkeys monitoring team during 5 months (from May to September 2016). From October 1st, 2016 he has been recruited by Primate Expertise where he is in charge of field activities regarding Primate Research and conservation in Kahuzi-Biega and adjacent forest. Primate Expertise (PEx) is a local Non-Governmental Organization dedicated to education, research and conservation of Primates in DR Congo. He was also hired in October 2016 as an assistant teaching assignment in the Biology-Chemistry Department at ISP/IDJWI.